What would you do if you were settling down for a quiet bedtime story and you realized that a crocodile had fallen into your storybook and was — not to put too fine a point on it — wreaking havoc? Would you slam that book shut and cram it back onto the bookshelf? Or would you be brave enough to peek? Nick Bromley works in educational publishing. His collaboration with Nicola O’Byrne and Nosy Crow on the words for Open Very Carefully is his publishing debut. Nicola O’Byrne was banned from watching Saturday morning television by her parents and she has been drawing ever since. She grew up in Singapore surrounded by the vibrant colors of the tropics and had not even heard of illustration as a career before she discovered the Illustration course at Edinburgh College of Art. She has a masters in printmaking from Camberwell College of Art. Nicola O’Byrne gets most of her ideas for children’s books when she should be working on something else, and bases all of her characters on people she knows. She lives in Los Angeles. 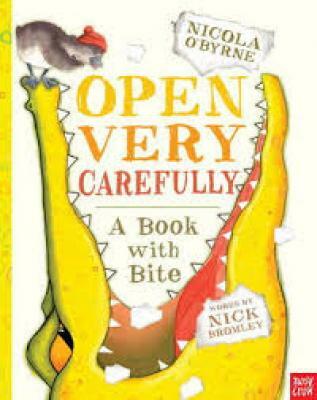 Debut author Bromley stumbles with the wrapup to his self-referential story, closing with a weak “Where do you think he’ll turn up next?” Regardless, O’Byrne’s crocodile is a personable antihero—she underscores his disruptive nature by drawing him in a brash, aggressive style that contrasts mischievously with her soft, storybook duckling—and her integration of typography and action is consistently ingenious. This is so engagingly interactive that it would make a fabulous app, and even in book form it will appeal to kids who relish the game-playing aspect. A clever way to get kids thinking about the infinite possibilities of stories. By breaking the barriers, cleverly crafted books such as OPEN VERY CAREFULLY challenge and engage the reader in a special way—and amuse parents at the same time. Bright reds and yellows, active line work, and plenty of white space create high energy and allow for the croc to interact with text and with the audience. This bold book will be effective as a group read-aloud, but some of the jokes will work well one-on-one, allowing children time to explore what the crocodile does with story and text.